The last few years saw Highland Park becoming the scene of a culinary zeitgeist, with choice dining options emerging on a regular basis. Here’s our guide to where and what to eat and drink in this exciting historic neighborhood. Have your heart set on moving to the area? Check out some of our beautiful listings located just up the street: this bright Bungalow in the quiet Garvanza enclave is available for lease, and come see our stunning view home 1620 Kilbourn St, just minutes drive from from all the happenings along Figueroa Blvd. Also coming soon to Highland Park is ArroyoHP, a collection of 20 modern homes with rooftop decks, available in 2019 but you can get on the interest list already – just send us an email. Arguably the beacon of the culinary delights that were to come to Highland Park, the sunny Kitchen Mouse cafe opened doors in 2014. Bohemian interior sports macrame wall art, light timber benches and fresh flowers, a delightful setting to tuck into the many gluten-free options on the menu. The Moros Cakes plate (mushroom and rice patties with a side of salad) makes for a hearty lunch, as does the dill quinoa salad. 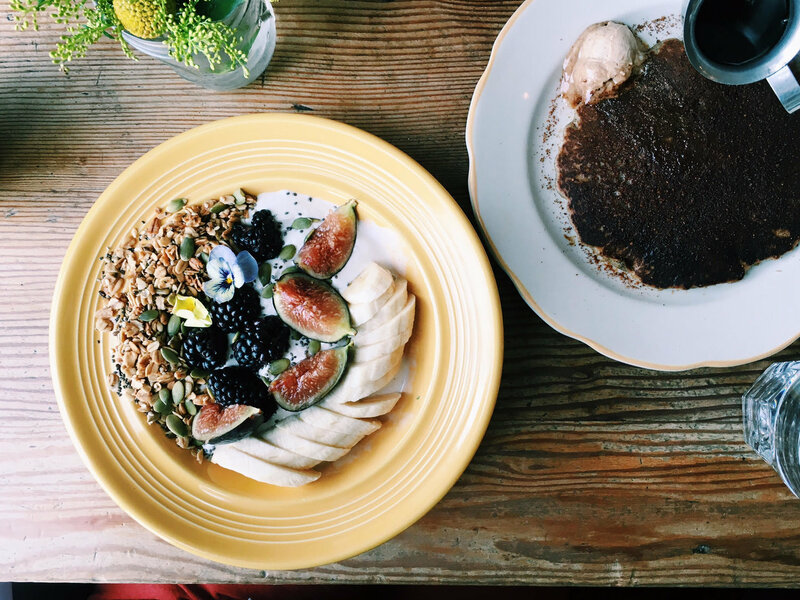 For breakfast, the vegan and gluten-free pancakes, adorned with toasted coconut and a dram of Vermont maple syrup, are the uncontested crowd favorite in all their light, flakey, and fresh berry topped wonder. A few steps from Kitchen Mouse, another beast, aka a new dining sensation recently appeared: HiPPO offers a fun selection of plates that range from fresh oysters and grilled pork ribs to light pastas. The beautifully rendered interior is charmingly woodsy, setting up a perfect stage for palate-delighting meals paired with delectable wines. We found that the Wax Beans surpassed what we imagined beans could do, and were utterly smitten with the autumn squash cappellacci pasta and the grilled chicken thighs. 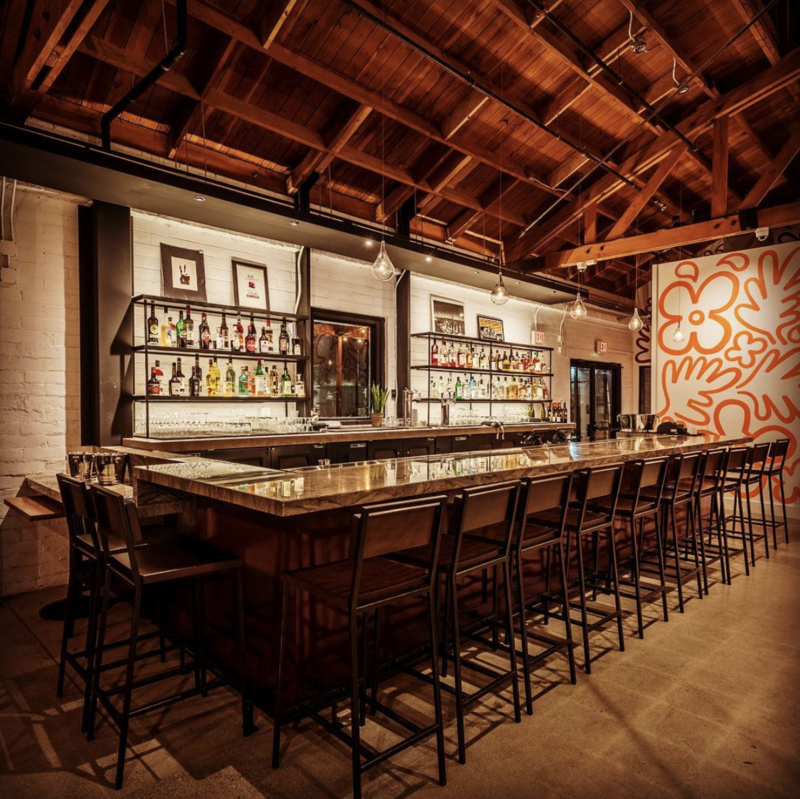 No matter what you choose, you can’t go wrong – chef Matt Molina is a James Beard Foundation Award-winner and his HiPPO partners Joe Capella and Randy Clement hail from the Eastside oenopphile’s favorite, Silverlake Wine. In the mood for a quick bite? That deeply human need is exactly why pizza was invented, probably in Rome, some centuries ago. 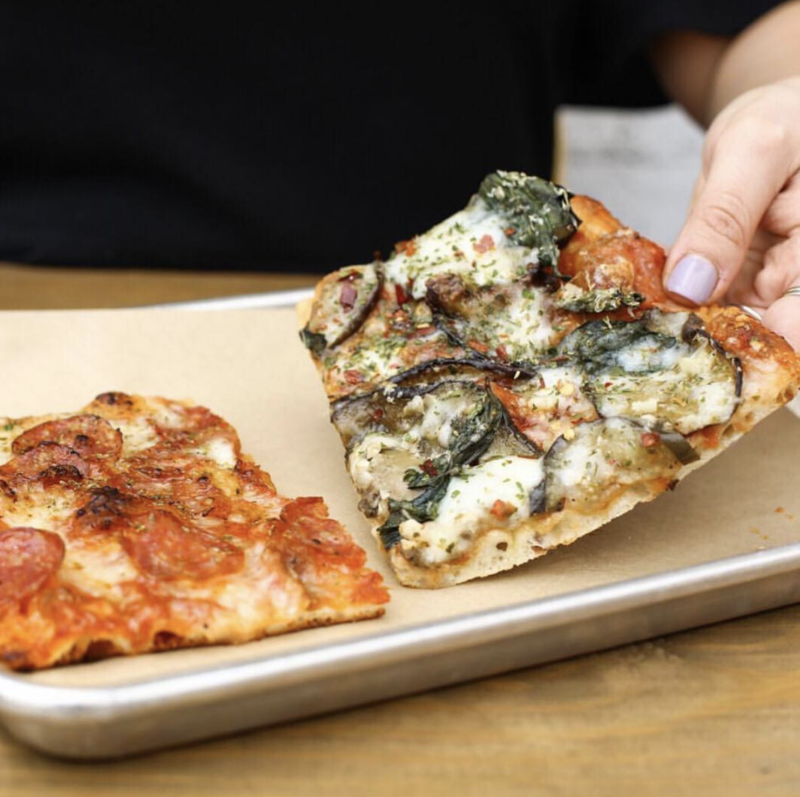 Luckily, we need not travel to Italy to obtain a slice of Roman-style pie, because we can get it at the Triple Beam Pizza, right here in Highland Park. The pizza is served in long, thin sheets, cut by length into squares and served at room temperature just like in Rome (you can opt for a heated version too, if that’s your preference). Grab a slice and a glass of vino and be like the Romans! November is drawing to an end, which means shorter days and brisk nights – the perfect time to indulge in some delicious dumplings. In Highland Park, you’ll find these tasty morsels at Mason’s Dumpling Shop, from the folks behind Monrovia’s famed Luscious Dumplings. 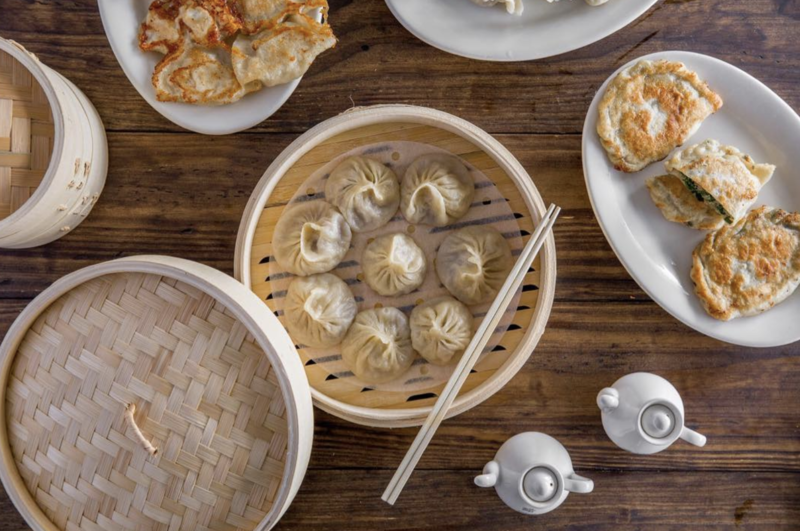 There are options for boiled, steamed, and pan-fried dumplings, as well as vegetable sides, beef and pork buns, and smaller rice bowls. 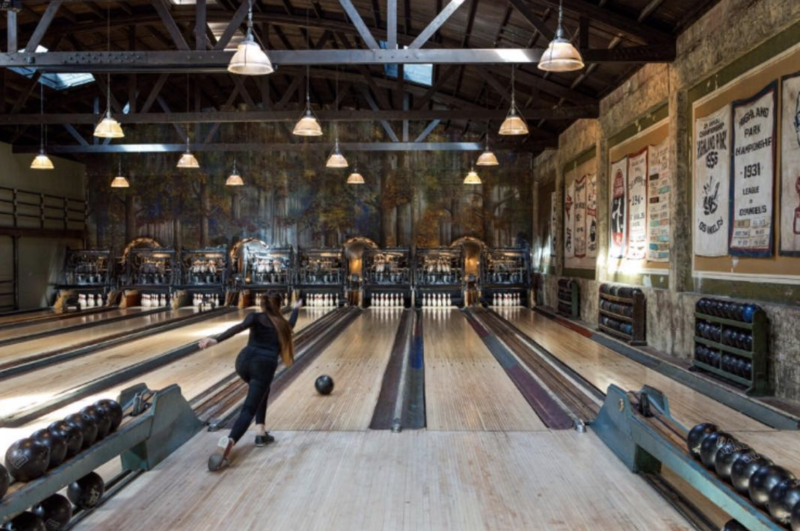 Get your fill, then head over to Highland Park Bowl for a post-prandial drink as you hone your bowling skills and watch the pins fall.